Until recently part of Araneidae (Orb Weavers) this group has now become its own family. 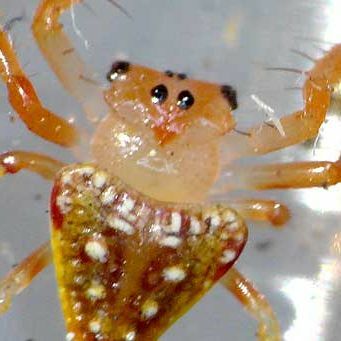 The most commonly seen and photographed of the Australian Arkyids is Arkys, a genus with many brightly coloured spiders somewhat crab-like in form, with strong spiny front legs. Arkyids are usually ambush hunters, without hunting webs. Thery are commonly found on foliage, often hiding un the undersides of leaves. Some appear to mimic other animals, including moths, others are cryptic (camouflaged). Brightly coloured Arkyids can disguise themselves amongs flowers. A small, rather nondescript ambush hunter in coastal rainforest from south eastern to northern Queensland. The rearmost of the central quadrangle of eyes are slightly larger and slightly wider apart. The carapace, or top of the cephalothorax, is flat and covered with pale, forward-pointing hairs.